Provide comfort for the family of John Koett with a meaningful gesture of sympathy. 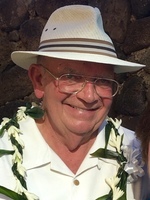 John William Koett, Jr., MD, PhD, passed away peacefully on February 5th, 2019. He was born in San Diego at Balboa Naval Hospital on August 23, 1944. His father was a Navy radiologist and subsequently moved frequently as a young boy; one of his favorite experiences was living in Guam as a child and playing in the jungle with his brother. John retired as Captain from the Navy after 22 years of service as a pathologist. He continued his career for another 26 years at Riverside University Health System Medical Center as Chair of the Department of Pathology and director of laboratory services. Throughout his career he also had the opportunity to teach medical students, which he so loved, and was awarded professor of the year by his beloved students. John loved his family dearly and is survived by his loving spouse, Rita Rae Koett of 49.5 years and his five children, Jennifer Lynne Koett, Dr. John Leland Koett, Dr. Jamie Louise Koett Seneca, Joshua Loren Koett and Jared Lawrence Koett, sisters in law, Dr. Megan Elizabeth Olson Koett, Bree Francesca Koett, son- in- law, Joseph Seneca, grandchildren, Liam James Koett, Sam Leland Koett and Francesca Rae Koett and brother Dr. William Koett and sister Sarah Bardoni. He is preceded in death by his father, Dr. John William Koett Sr., mother, Avis Vivian Koett and sister, Ann Praeger. John’s legacy will live on in the hearts and minds of everyone he interacted with. John was a very spiritual soul, enormously kind, generous, ethical, hard working and intelligent. He had a playful and witty sense of humor and loved working in his yard; it was his sanctuary. He was a naturalist, a tree hugger, and admirer of all of God’s creatures. He loved to build model airplanes, read history and travel with his buddy, Rita. He will be missed each and every day and remembered in all things beautiful. We will love you forever, Kermit de Frog. Services will be held Friday February 15th at Ascension Catholic Parish in Tierrasanta. Vigil and Rosary at 10 am, Mass at 11 am, reception to follow . To send flowers in memory of John William Koett, please visit our Heartfelt Sympathies Store. Provide comfort for the family of John William Koett by sending flowers.